The carbon cycle refers to the exchange of carbon between the carbon reservoirs of vegetation, soils, rocks and sediments, water bodies and the atmosphere of the Earth. It involves multiple biological, chemical and physical processes at time scales spanning from seconds to millennia such as photosynthesis, plant and soil respiration, diffusion into oceans, and chemical reactions with rocks. The compounds being exchanged include carbon dioxide (CO2), methane (CH4), and a variety of organic and inorganic compounds. The balance of all carbon exchanges (incomes and losses, or sinks and sources) between those carbon reservoirs for a given time and region is what we call the carbon budget. The term territorial carbon budget is used when we focus exclusively on the carbon exchanges between land reservoirs and the atmosphere (vertical exchange). This balance needs to be extended to include non-territorial exchanges such as those of carbon exported in dust and rivers, and carbon in imported and exported materials such as food and wood. The budget figure shows all major carbon flows for Australia averaged for the period 1990-2011 (Haverd et al. 2013a; The Tools - HYPERLINK). 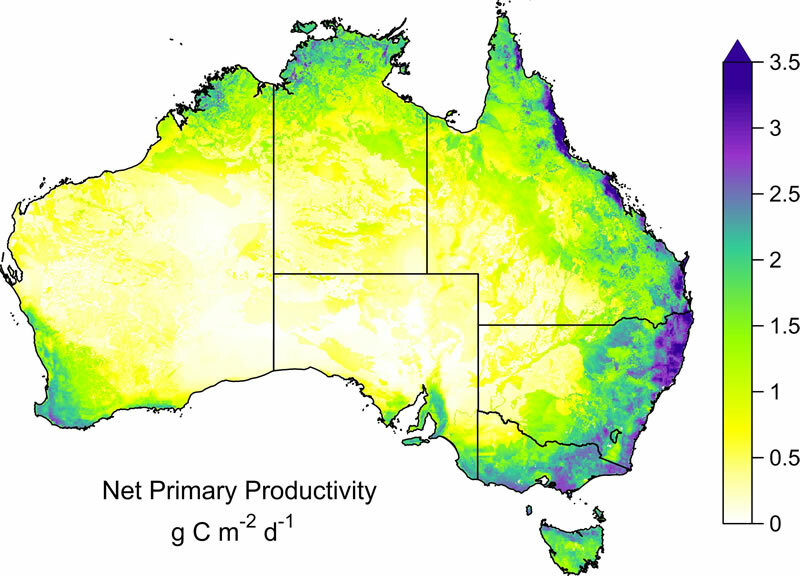 It includes: 1) net primary production, NPP (accumulation of biomass in the biosphere), 2) net ecosystem production (the balance between NPP and soil respiration), 3) emissions from fires, 4) emissions from land use change, which is the balance between land conversion (largely forest to agriculture) and reforestation, 5) riverine carbon export, 6) export of carbon in dust to the oceans, 7) export of carbon harvest (wood, crop and livestock), and 8) carbon flows in fossil fuel including emissions from the combustion of fossil fuels in Australia and the carbon contained in traded fossil fuel resources. 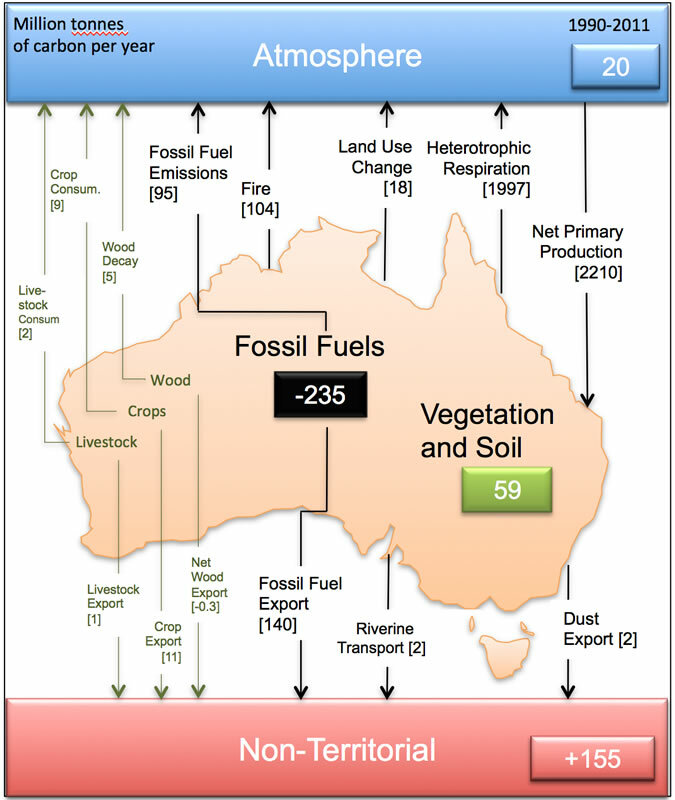 Taking all fluxes together, the Australian biosphere gained carbon on average at 59 million tonnes of carbon per year (1 Mt = 1 Teragram, Tg) during the period 1990-2011. This amount is the equivalent to 62% of Australia’s emissions from fossil fuels for the same period (this calculation excludes the fossil fuel exports shown in the budget figure). The loss of carbon from the biosphere is dominated by soil respiration, with smaller losses due to fire, harvest, and land use change, and minor ones from transport by rivers and dust. Hidden in this average balance, there is a large year-to-year variability driven mainly by precipitation. During droughts the biosphere ‘breathes out’ nearly an equivalent amount of carbon as that emitted from the combustion of fossil fuels, while very wet years have the opposite effect. On average 2.2 billion tonnes of carbon is taken up by plants every year or 0.76 grams of carbon per square meter. This amount is equivalent to 73% of the global mean for a global net primary production of 55 billion tonnes. Emissions from the combustion of fossil fuels were 95 MtC on average during the period, while a net of 140 MtC were exported overseas. The net export of carbon in fossil fuels is growing rapidly, with Australia exporting 2.5 times more carbon in fossil fuels than it emitted by burning fossil fuels. Was it a bit too much?